Hosted by the High Springs Lion's Club. Proceeds to benefit the Gainesville Fisher House to support Veterans families while their hospitalized Veteran recovers in the hospital. Open to all cars, trucks and motorcycles. Flea market, swap meet and health fair. Awards for top 10 and best of show. CASH door prizes, 50/50 and sounds by The Big D. Registration includes one participant BBQ lunch. Every month on the second Thursday. Hosted by the North Florida Mopar Association. All years of Mopar are welcome. This is a car and tractor event. Goodie bags to the first 50 registrants. People's choice awards, music, door prizes, raffles, and kids activities. There will be an antique tractor plow and crafter's fair & quilt show. All proceeds will go to the “Blanketing Our Streets” ministry which helps clothe and feed the homeless and needy in our community. Trophies awarded in each class with goodie bags for the first 20 to register. There will be door prizes, raffle prizes, 50/50 raffle, craft and local vendors, food, refreshments, and more. 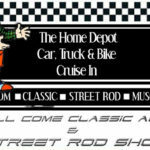 Hosted by Cruisers Unlimited Car & Truck Club. Open to all years, makes and models. Awards for the Best of Show and Top 30. Dash plaques for first 75 cars registered. Wind Creek will be offering BOGO at the Taste Buffet and a discounted hotel room offer of $99. Registration 8-11am, judging 11am-1pm, awards at 2pm at the Sound Lounge. Vendors, giveaways and VIP 50 awards plus a new Featured 40 class for non-import vehicles. Email us with three pictures of your ride (exterior/interior/engine) and a short description to be considered for the Featured 40. Vendors and sponsors welcome. Media passes are available. Every month on the third Saturday. Hosted by the Spanish Trail Cruisers Car Club and sponsered by Wendy's. Come out and show off your wheels, hang out and swap stories, and get a BOGO burger coupon from Wendy's. Proceeds will benefit the Masonic charities. Open to all years, makes and models of cars, trucks and motorcycles. Trophies, food, vendors, and DJ music. Pre-registration will include a t-shirt. Presented by the Tallahassee Region of the Antique Automobile Club of America and held in conjunction with the annual Jefferson County Watermelon Festival. Open to all vehicles, any year car, truck or motorcycle. Choose to display your show vehicles or have it judged for a trophy. All registrants will receive a prize bag plus a chance to win larger prizes. The weekend will include a 5K melon run, vendor village, parade at 10am, art exhibit, entertainment, and wacky watermelon games. Hosted by the Northwest Model A & T Club and the Playground Corvette Club. Participants & people's choice awards to the top 75 cars. 15 judged Best of Show awards. Door prizes and dash plaques.